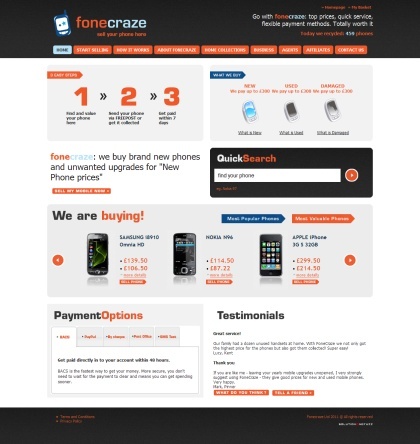 Leading mobile recycling site, FoneCraze is offering their customers top prices for many new, used and damaged mobile models, fast service and a variety of different payment methods. By selling your old mobile at FoneCraze you can choose to be paid by either BACS, Paypal, cheque, in cash at the Post Office or by SMS Text. They offer to buy unwanted upgrades and new handsets for new phone prices. They also offer top cash payments for used and damaged handsets. Also if you send 10 or more phones they will provide a free courier collection. Recycling your mobile with FoneCraze really is as easy as 1,2,3! I have used this company and received an email confirming they had received our mobiles over two weeks ago, but we have been unsuccessful in getting them to answer our emails and never answer thier phone and you can’t leave a message. We are now quite concerned that this is a fraudulant company and we will never receive payment! i have had the same problem, we sent our phone and likewise,received an email saying they had received it but have not received any paymment and will not answer calls or emails. its a con !! I sent my nokia too raise cash as mt family are struggling, yet they have seemed to kept the phone not answering emails or calls, c**ts!!!!!!!!!!!!!!!!!!!!!!!! Hi i have sent all our old mobile phones off to them and have still not heard anything.This was on 3rd May. They have failed to answer any e mails. DO NOT USE THEM !!!!!!! Sell Old Mobile Phone no longer recommends the use of the Fonecraze site to recycle your old phone and all links have been removed. Recommended mobile recycling sites can be found on the top left of this page or by searching for the best prices using the comparison tool below.